Mechanicsburg, PA: This high quality LED Extendable Magnetic Flashlight that can be used for everyday household projects, provides the following features and capabilities. The main functionality of this LED Magnetic Flashlight Tool offers the ability for the user to find and retrieve objects in hard to reach areas. The magnets in both the head and tail end of the flashlight permit the recovery of magnetic objects. This product is constructed of rugged aluminum and includes a stainless steel clip. The LED Head, also made of aluminum, contains 3 bright LED’s. The flashlight head is attached to approx 3” of sturdy flexible metal for multi-directional applications. 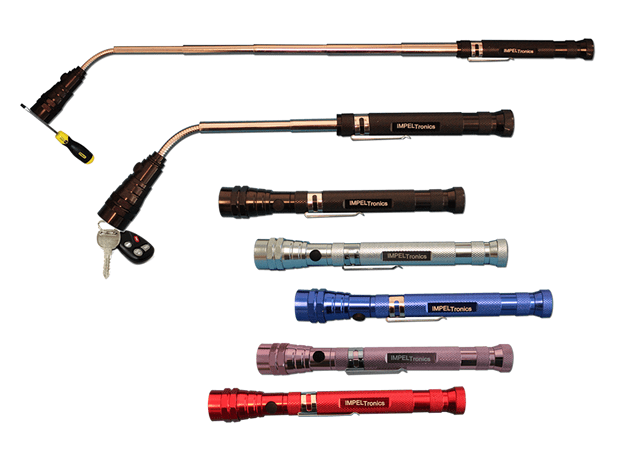 Visit http://www.impeltronics.com/products/extendable-telescoping-magnetic-flashlight/ for more information.